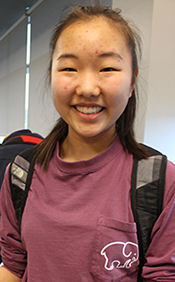 When Tech Valley High School (TVHS) freshman Purevsuren Batdorj saw her older brother create a computer program for the first time, it inspired her to want to become a computer scientist. Since then, computer programming has been a regular hobby for Batdorj, one that allows her to flex her creativity. Starting next fall, Batdorj and her peers will have the opportunity to take a computer science elective at TVHS for the first time. It will be offered in partnership with Siena College under the grant-funded Siena Plan for Attracting and Retaining Computer Scientists (SPARCS), which focuses on recruiting and retaining computing majors in high school and the first two years of college. The SPARCS program includes a high school dual enrollment program that introduces computer science education to Capital Region high schools that are not currently offering it. It is made possible by a $688,000 National Science Foundation grant that was awarded to Siena in 2014. The funds allow Siena faculty to prepare high school teachers in the Capital Region to teach Siena’s introductory computer science course. TVHS math teacher Jason Irwin is currently taking the course at Siena in preparation to teach it this fall. The U.S. Bureau of Labor Statistics indicates there were more than 600,000 high-paying tech jobs across the United States that were unfilled last year, and by 2018, 51 percent of all STEM jobs are projected to be in computer science-related fields. Siena College professor Dr. Meg Fryling said the grant allows the college to help address a shortage of computer science professionals in the workforce, and begin to address a long-standing gap in New York state high school education by helping local schools gain the knowledge necessary to teach computer science. She said the partnership will help students gain exposure to computer science while still in high school. Fryling said there is currently no New York state computer science teacher certification. As such, few high schools offer computer science courses, so when students attend college, computer science is often not considered as a major due to lack of exposure. Principal Niedermeier said the goal is to make an introductory computer science course a requirement for all TVHS students in the 2017-18 school year. This will help address the lack of exposure that Fryling referenced. Batdorj said when it comes to computer science, there are a lot of stereotypes against women who want to pursue technology in college and careers. The computer science skills gap is being highlighted nationally under President Barack Obama’s Computer Science For All initiative, which aims to empower all American students from kindergarten through high school to learn computer science and be equipped with the computational thinking skills they need to be creators in the digital economy, and to be active citizens in our technology-driven world. “In the coming years, we should build on that progress, by … offering every student the hands-on computer science and math classes that make them job-ready on day one,” Obama in his 2016 State of the Union address.